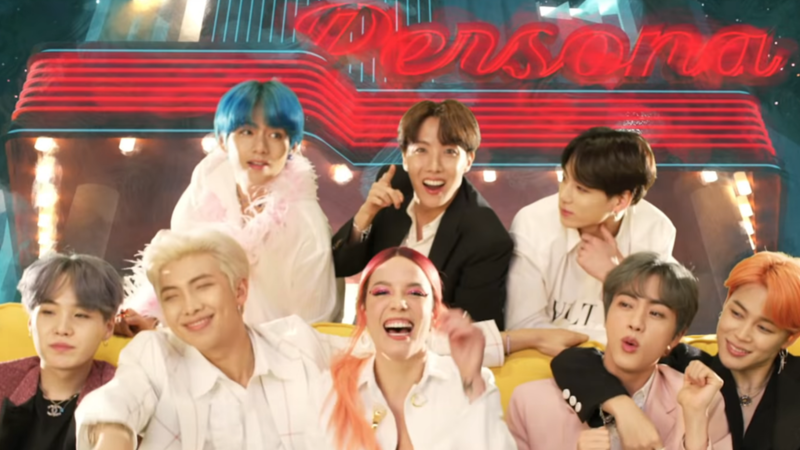 On BTS’s new EP, “Map of the Soul: Persona,” Halsey appears as a feature on the lead single “Boy with Luv” and the track “Make It Right” features Ed Sheeran as a songwriter. For a K-pop band who has yet to have a true runaway hit song in the U.S., getting these two major artists involved on their EP is already extremely impressive. What they may lack in a concrete hit they have more to make up for in fanbase. Their massive devout online fanbase, known as the Army, will most certainly do whatever they can to ensure that this EP is massive, and the lead single is well on its way to breaking the YouTube 24-hour record. While many may consider BTS’s rise to fame strange, unexpected or unexplained, “Map of the Soul: Persona” is the place to go to see why fans love them so much. At the core of a K-pop EP is, usually, the lead single. EPs are released primarily as vessels to promote this one single, rather than the conventional U.S. model of multiple singles being released to promote an EP. Here, “Boy With Luv” is the single, featuring American pop singer Halsey. This is perhaps the best encapsulation of BTS fervor. It is a massively catchy song, showing off a diverse array of talents among each of the seven members of BTS, Jin, Suga, J-Hope, RM, Jimin, V and Jungkook, as they expertly weave from pop hooks to rap breakdowns, as well as a wonderfully delivered hook by Halsey. It may not be anything particularly ambitious, inventive or even really unique, but it most certainly delivers strongly on all the aspects it is going for. However, the rest of the EP mostly fails to keep up the expert balance between the rap and pop elements of BTS, and instead decides to stay in one lane or another. While each aspect is good, it ends up making the EP feel a bit disjointed and unclear in what it wants to be. Songs like “Intro: Persona” and “Dionysus” are essentially front to back rap songs, while others such as “Mikrokosmos” and “Jamais Vu” have no rap to be found. Both styles are ones that BTS pulls off effectively, and the diversity in their music stylings is certainly commendable in a genre that often stays fairly static, but it results in the EP feeling like it truly lacks a central identity or tone to it that could really take it to the next level. While the pop-angled songs are, in fact, still quite good, they also pay a large part in contributing to this identity crisis. Perhaps most guilty of such is “Make it Right,” which is a mostly forgettable mid-EP, mid-tempo pop cut, which really lacks any feeling of personality whatsoever. The other two mid-EP tracks, pop-tinged “Mikrokosmos” and rap-tinged “Home,” have similar issues. Even when they reach some form of signature BTS rap breakdown, it really does not sound like anything that any other K-pop boy band could not do and is not doing. There is not much bad about these songs per se, but they stick out like a sore thumb being surrounded by much more interesting music. However, the EP is bookended by four rather strong songs. Album opener “Intro: Persona” and album closer “Dionysus” are powerful, upbeat and unique anthems with notably strong songwriting, the former being about, ironically, an identity crisis and the latter being about the struggles of fame. “Boy with Luv” and “Jamais Vu” are much more pop-minded, though sharing similar strengths in their ability to truly stand out from the rest of the K-pop scene. Tracks like these are why BTS have the following they do. However, none of these songs really sound like a development from where they were during their previous “Love Yourself” series of releases. This would all be far more interesting if they were willing to do something more innovative with their massive following. As a pop culture phenomenon, BTS and “Map of the Soul: Persona” are fascinating to listen to, as it appears that a non-English speaking group is finally crossing over to the U.S. in a big way. However, for being industry titans, it is ultimately a bit disappointing that they could not string together a slightly more cohesive body of work with a more central identity, instead relying on the strength of about half of the tracks and an old sound to carry it through.